What is 4D ultrasound? Are there any risks? 4D means Four Dimensional. This advanced system features “real time imaging", the 4th dimension being time. The result is live action images of your unborn child. 3D/4D ultrasound utilizes sound waves to look inside the body. The technology is similar to radar. A probe placed on the body emits sound waves into the body, listens for the return echo, and generates an image. This procedure is performed by a licensed sonographer. How long does a 3D/ 4D ultrasound last? A typical exam for an expectant mother lasts approximately 30 minutes (45-60 minutes for twins). At what time in my pregnancy should I schedule a 3D/ 4D ultrasound? Most 3D/4D ultrasounds are done between 24 and 34 weeks of gestation. What should I expect to receive at the 3D/ 4D ultrasound? You will be given a CD, DVD and 4-6 pictures. Will my insurance pay for a 3D/4D ultrasound? This 3D/4D obstetrical ultrasound is not a diagnostic test and is not billable to any insurance company. Therefore, you are required to pay at the time of the ultrasound. What if I am not pleased with the 3D/ 4D ultrasound? There are many factors that can impact the ultrasound scan. The baby’s position may prevent optimal views from being obtained. The volume of amniotic fluid can also affect the quality of the scan. Sound waves travel through water to create the images. The more fluid around your baby, the clearer the photos will be. The location of the placenta can be factor in blocking the view of the baby. Finally, if the mother is full figured, the sound waves have more tissue to travel through which causes grainier photos. Since there is no guarantee concerning these conditions, the fee is NOT refundable. A second attempt may be scheduled upon request. What are the times for making an appointment? Currently, appointment times are between 8:30 and 1:30 on Tuesdays and Thursdays. If you are interested, a staff member will take your information to the sonographer who will contact you to schedule a date and time for the scan. What if I have to cancel a 3D/4D ultrasound? A $50.00 cancellation fee will be charged for failure to cancel at least 24 hours prior to your appointment. How many people can come with me to the3D/ 4D ultrasound? 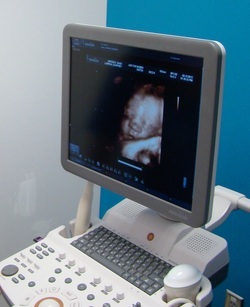 The ultrasound room can accommodate two (2) additional adults. If you have small children, please note that the ultrasound will last approximately 30 minutes: children can become restless and bored. Remember, you will get a CD, DVD and pictures to take home with you.